When the gun went off to get the men's 10k underway, we at LetsRun.com felt like we were watching a heat at Mt. SAC or Stanford, as a ridiculous 39 runners toed the line. But the packed Bird's Nest crowd made us remember that this was indeed the Olympic 10k final. The first two laps were modest (67 and 69) but the Eritreans, led by Kidane Tadasse, soon injected some pace as Tadasse ran a 30+ 200m from 1k to 1,200m. Overall, the 3rd and 4th laps were run in 64 and 62 so that the opening 1,600m was hit in 4:22. The pace remained honest for several laps (3200m in 8:43) and it was already clear at this point that it was going to be an All-African affair up front. Abdi Abdirahman was the top American at this point and the African-born athlete was in roughly 21st place. The pace drifted back to the 68 per lap range from 3k through halfway (13:48.00) as Tadasse continued to lead, but the race was soon to develop into what many expected - a battle between Ethiopia, Eritrea and Kenya. At 6k, the Great One, Haile Gebrselassie, gave the crowd a thrill as he took the lead of the roughly 23-person lead pack which still included Abdirahman as well as Oregon Duck Galen Rupp. 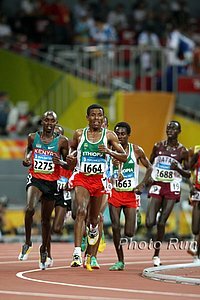 At 6,800m, things really got going thanks to the top Eritrean, 2004 bronze medallist Zersenay Tadese, who took over with a real move to break up the pack. A stunning 61.42 for the next lap immediately whittled the lead group down to a baker's dozen. Haile G was right on Tadese's heels and Tadese looked back over his shoulder and moved to the outside several times - we couldn't tell if he was angry at Haile for clipping him or if he wanted help with the pace. Interesting to say the least. The surging abated a little but each of the last 4 kilometers would be run at 2:40 or faster. With four laps to go, there were only seven in contention - the 3 entrants from Kenya, the 3 from Ethiopia and Tadese, the lone remaining Eritrean, who had prevailed in the seething conditions of the 2007 World Cross-Country Championships and might have been hoping for much warmer conditions than the 68 degrees that greeted the runners at the start. The tension had been building for over 25 minutes and several questions remained. Could anyone touch the defending champion Kenenisa Bekele, who had looked relaxed and perfectly positioned throughout? When would the decisive move be made? And could the great Haile G. somehow re-summon his sparkling magic and medal in the 10k at the age of 35? No one made a bid for glory until just before the final circuit. On the penultimate homestretch, Bekele took the lead and made his move and his teammates quickly responded. At the bell, it was an Ethiopian 1-2-3 as Bekele was trailed by Sileshi Sihine and Geb. With 300m to go, Geb relinquished his bronze medal position to Kenya's Micah Kogo, apparently the only one that could go after Bekele and Sihine, who had gapped the field. 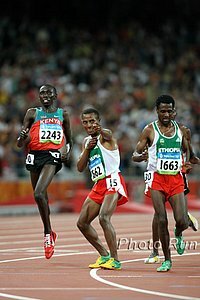 There was, however, no doubt over the final lap that Bekele and Sihine would end up as the top two, and unlike last year at Worlds (click on that link to see the fantastic finish from the 2007 Worlds 10k, when Bekele had to come from behind over the final 200m), there was never serious doubt midway down the backstretch as to whether Bekele would win. Sihine put up a good fight for nearly half of the last lap, but with 220m to go, it was clear Bekele was pulling farther and farther ahead. Bekele's final 200m of 26.4 and a searing last lap of 53.42 (and a final 1,600m of 4:02 and change) would deservedly get him a second straight Olympic gold in a new Olympic record time of 27:01.17. All together, that's 5 straight victories at 10k in major championships for Bekele (2003 Worlds, 2004 Olympics, 2005 & 2007 Worlds, 2008 Olympics). As fans watched Bekele dominate the final lap, coupled with Bernard Lagat's struggles today in the 1,500m semis, it seemed as if we were watching not only the 10k champion tonight but very likely the 5k champion as well. Time will tell. Having proved without a doubt he's still the king of the 10k, surely he'll be temped to go for the 5k to grab the double golds he barely missed in 2004. While the final lap was another crowning of Bekele as the greatest 10k runner on the planet, it also marked a reaffirmation of Sihine as decisively the 2nd best 10k runner on the planet, as Sihine was head-and-shoulders above everyone besides Bekele over the final lap. For the 4th straight global championship dating to the 2004 Olympics, Sihine would finish 2nd to Bekele in the 10k as he clocked 27:02.77. The only question that remained was if Geb could somehow get a medal. And the answer was ... no. Father Time has robbed the Great One of his once lethal kick. Seven years removed from his last medal in a major 10k, it was wishful thinking that he might medal here, but with less than a lap to go, there he was in 3rd. But once Kogo charged past, Geb would fall farther behind as he was unable to respond. Kogo would let up a bit at the line and his hard-sprinting teammate Moses Masai nearly nipped him for the bronze as they ended up with the identical time of 27:04.11, with Kogo getting the bronze thanks to the photo. Eritrea's Tadese, who did a lot of the leading in this race, ended up 5th in 27:05.11 with Geb sixth in 27:06.68. American Galen Rupp had a nice race for a non-African-born runner as he finished a very respectable 13th in a fine seasonal best time of 27:36.99, although truth be told, watching this race (or any global 10k) makes one wonder why all Americans don't immediately move up to the marathon. Abdirahman ended up 15th in 27:52.53 while Jorge Torres was 25th in 28:13.93. In the end, this race went almost exactly according to form up front. It was one of the few track races on the men's side at these Games where virtually everyone could pick the top two finishers before the race. 2 Sileshi Sihine ETH 27:02.77 . 5 Zersenay Tadese ERI 27:05.11 . 6 Haile Gebrselassie ETH 27:06.68 . 9 Fabiano Joseph Naasi TAN 27:25.33 . 10 Boniface Kiprop Toroitich UGA 27:27.28 . 12 Kidane Tadasse ERI 27:36.11 . 14 Dickson Marwa Mkami TAN 27:48.03 . 15 Abdihakem Abdirahman USA 27:52.53 . 16 Abdellah Falil MAR 27:53.14 . 17 Juan Carlos de la Ossa ESP 27:54.20 . 18 Hasan Mahboob BRN 27:55.14 . 19 Dieudonn� Disi RWA 27:56.74 . 20 Essa Ismail Rashed QAT 27:58.67 . 21 Samwel Shauri TAN 28:06.26 . 22 Felix Kikwai Kibore QAT 28:11.92 . 23 Carles Castillejo ESP 28:13.68 . 24 Ayad Lamdassem ESP 28:13.73 . 25 Jorge Torres USA 28:13.93 . 26 Surendra Kumar Singh IND 28:13.97 . 27 G�nther Weidlinger AUT 28:14.38 . 28 Kensuke Takezawa JPN 28:23.28 . 29 Juan Carlos Romero MEX 28:26.57 . 30 Sergey Ivanov RUS 28:34.72 . 31 Takayuki Matsumiya JPN 28:39.77 . 32 Teklemariam Medhin ERI 28:54.33 . 33 Eric Gillis CAN 29:08.10 . 34 Rui Pedro Silva POR 29:09.03 . 35 Alejandro Su�rez MEX 29:24.78 .
. Cuthbert Nyasango ZIM DNF .
. David Galv�n MEX DNF .
. Mohamed El Hachimi MAR DNF .
. Khoudir Aggoune ALG DNS .